The episode begins over lunch with Carlos Ayala at Golden Unicorn in New York’s Chinatown. Ayala is the Vice President of International at Perdue Farms. This means he’s the guy in charge of exporting products that aren’t so desirable in the U.S. — including chicken feet, or paws. On the menu that day at the Golden Unicorn: chicken paws in black bean sauce and a special, off-the-menu, ginger-infused chicken paw dessert. Ayala tells us that the U.S. exports 300,000 metric tons of chicken paws every year, nearly all of them to Asia. This export market is big business for chicken manufacturers in the U.S. and is not without drama. We also visit MedWish International in Cleveland, Ohio, which repurposes medical “waste” — often unused supplies or outdated equipment — and sends it to needy hospitals in 90 countries around the world. (Tight regulations in the U.S. forbid MedWish from sending the stuff to needy hospitals or clinics in the U.S.) To date, MedWish has kept 2.2 million pounds of medical waste out of landfills. Finally, Nathan Myhrvold of Intellectual Ventures, a recurring character in these parts, talks about the nuclear-energy firm TerraPower that he, Bill Gates, and others have founded. How is this nuclear-energy firm different than others? It uses a different technology and, most relevant to our episode, a different fuel: nuclear waste. As it turns out, Myhrvold also shares with us his chicken-feet recipe from his uber-cookbook Modernist Cuisine. you know, both you guys and planet money get distribution help from some form of public radio. one program talks about Myhrvold as a patent troll while the other (you guys), seem to slurp his koolaid. why don't you do an episode about the hidden side of technology patents? it would be fascinating to hear more about the hidden side of technology patents. intellectual ventures spins a lovely pr-web bragging about their support system for inventors, but the whole patent business is pretty sketchy. I am not so certain that exporting less desirable production outputs should count as recycling because those products aren't being put back through the production cycle...they are just being used instead of thrown away. Making a product then using that finished product at some later point in its lifecycle as an input to make new products is clearly recycling. Simply selling something that is ordinarily discarded due to lack of demand is more on the Reduce side of the sustainability triangle. So pre-consumer paper recycling isn't "recycling" (e.g., scraps from packaging) in your mind? Why not? It turns into newsprint just as well as the post-consumer stuff, and if we didn't recycle it, it would end up in the landfill or incinerator. I'm surprised by Mr Ayala's claims of nonexistant US demand for chicken feet. Has he ever been to a supermarket in Georgia? If Purdue isn't supplying the chicken feet down here in the south, somebody seems to be. The recyling you talk about happens a lot through the "food" production chain. For instance a batch of frito lays that went stale end up in animal food and is fed to cows, pigs and chicken. The same goes for by-products from sugar production. The "waste" from the beets or sugar cain also end up in animal food, usually fed to them as pellets. The same happens further on in the chain, were the "waiste" from slaughterhouses ends up as glucose (basically hydrolysed collagen) in various products like candy or soda's. The animal feed industry uses a lot of these "recycled" products. That's why most of the various scandals regarding polluted meat can be traced back to this industry. Isn't Nathan Myhrvold the same person that was in the expose done by "This American Life"? The episode "When Patents Attack" claims that his company Intellectual Venture is one of the largest patent trolls out there? I love chicken feet. They're truly a delicacy. Maybe it'll eventually catch on in the US. Raw fish was considered exotic in the US not that long ago. I just wanted to leave a comment to say how much I enjoy this podcast, being a chicken feet eater myself, and yes, I am a foreign-country-born-Chinese descendent. One nugget that you might not know, is that Chinese give grand-euphemism to all the Chinese dishes. In this case, chickent feet are also called "Phoenix Claws", or ??. Thank you for this intriguing story. One aside. My father-in-law recently spent some time in Haiti training people to do ultrasounds on the heart (electrocardiograms). While there he spent days going through a warehouse of medical items sent to aid in the recovery effort. Some of these items had been sent 10 to 25 years earlier and were still in sealed boxes unused. Other items were being wheeled in and stacked while he was there. Most of his time at that site was spent helping local staff identify and sort the items. They made little progress. The anecdote in the podcast regarding the death due to lack of tools was a powerful one. I wonder though if that is accurate on a larger scale. Talk about wierd recycling. I heard a story from someone who worked in healthcare that the wast product from providing kidney dialysis treatment is a great fertilizer and works wonders for your lemon trees! One thing regarding Mr. Myhrvold's comment on nuclear waste not being used for anything...just being stored in Kentucky. I'm surprised that someone as knowledgeable as Myhrvold didn't know that every bomb dropped by the US military anywhere in this brave-new-world is "enriched" with depleted uranium, which is nuclear waste Myhrvold talked about. And I'm kind of surprised that Dubner didn't dig up this information. This is a well-known fact that the US military doesn't even deny; it just won't go into details. Supposedly depleted uranium makes bombs more potent. Chicken feet are a delicacy in China. The basic problem is that the Chinese want [at least] large chicken feet. 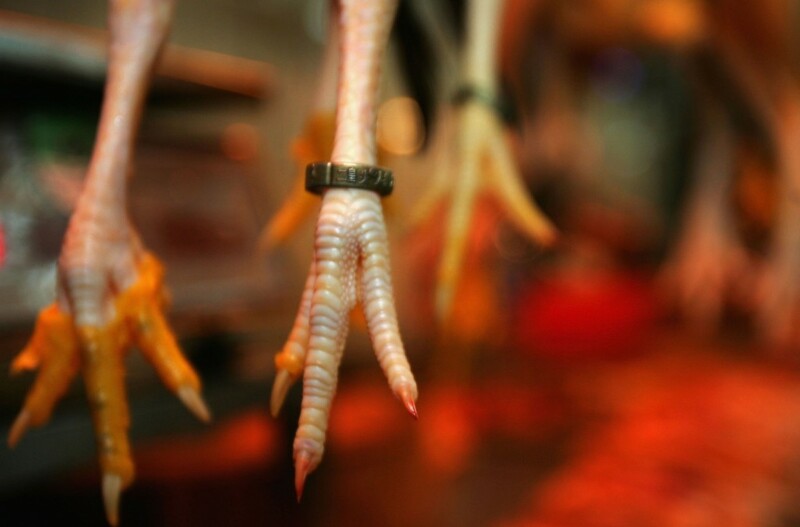 Since the vast majority of chickens produced in the U.S. are "fryers" that are slaughtered at the ripe old age of six weeks, their feet are generally, unacceptable small by Chinese terms. My father learned this the hard way by trying to ship chicken feet to China [actually Hong Kong]. I would love to see you do a similar interview with Kirk Sorenson about his concept for the Liquid Flouride Thorium Reactor. It has all of the same "waste eating" properties of the travelling wave reactor that Terrapower wants to build but it has one enormous advantage (among others)...we've already built one! It used to be that the keyword was 'reuse', or 'reusable'. The military couldn't make anything unless it was 'dual use'. We rarely through anything out when I was young, and it saved a lot of time looking for something that didn't exist at the stores. When I went later to South America and Europe I found it a more common practice. Then came the cheap Japanese 'throwaway' products, and later Chinese. I first noticed the results by seeing overflowing trash cans and litter along the highways. You should check out Collective Upcycle (http://collectiveupcycle.blogspot.com/). Its boutique of reused art/craft & handmade goods that roams throughout Cleveland. I am a huge fan of freakanomics radio and I was excited to listen to this episode because I am a huge recycling advocate. However when I started to listen to this episode I was appalled by the topic of eating chicken feet especially hearing from the vice president of purdue chicken. I am an animal rights advocate and have been for years. Once I heard the vice president of purdue was going to be on my first thought was "oh no" and once the topic of eating chicken feet and using it in all kinds of products (including black bean sauce which is usually a good vegetarian) I stopped listening. As I do believe in using all parts of the animal once slaughtered to reduce waste, I dont however support the unethical treatment of animals (which purdue does for the sake of the food industry). I will still listen to the podcast, I just wanted to bring it to your attention that I was offended at the subject matter and I considered for a second not listening to the podcast again. I just ask that freakanomics radio refrain from topics that include big food companies like purdue chicken and any issues of animal cruelty or companies that treat their animals poorly. Thank you.